Brands benefit from thoughtful and proper integration into lifestyle video content. Brands are applauded by women when integrated appropriately into their favorite video content. As part of the POPSUGAR Insights/ulive 2014 lifestyle video study, we asked women to describe the actions, if any, that they have taken as a result of a brand they saw advertised in a lifestyle video that they watched. 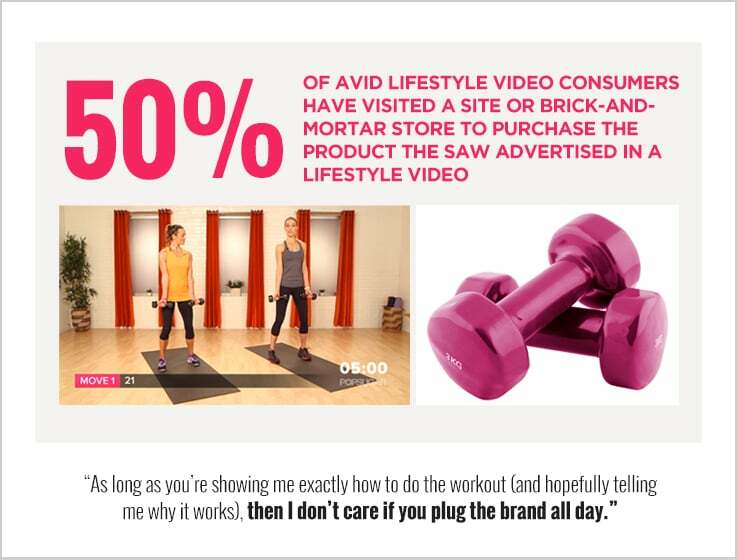 Alignment and integration into lifestyle video content drives consumers to take specific actions. After seeing a brand advertised in a lifestyle video, women have been motivated to visit the brand site (38%), conduct research on the topic (37%), seek out product coupons (31%), and visit the site or brick-and-mortar store to purchase the product (31%). Women are very open to brands appearing in and being aligned with lifestyle content, provided the brand integration provides value and is not overwhelming. Among specific audience segments, single or divorced women over the age of 35 (50%) were more likely to have visited the brand's website as a result of seeing the brand advertised during a lifestyle video, while younger women aged 18 to 24 (37%) and households with children (36%) were more likely to visit a site or brick-and-mortar store to purchase the brand they saw advertised. Avid lifestyle video consumers (women who watch 240+ minutes of lifestyle video per month) are even more open to brands than women overall, and 50% of them have visited a site or brick-and-mortar store to purchase the product they saw advertised in a lifestyle video.